Now that a new year takes off, how about a brand new calendar for your desk? 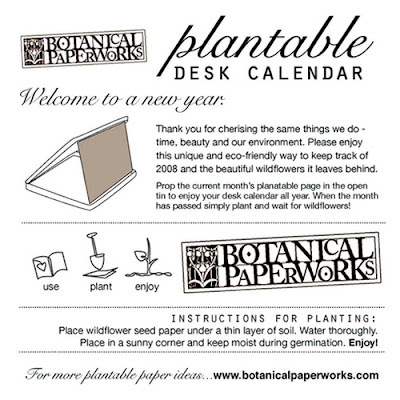 I so thrilled to come across this site, botanical paperworks. Here you can find plantable invitations, cards of all sorts and so many more! When the month passes, you simply detach the paper and plant it under a thin layer of soil. Wet it well, wait for the seeds to germinate (6-8 weeks) and voila! Your brand new plant. Sooo damn clever. I think everyone should have something like this. Here are the instructions that come with the calendar. For more information, stop by their FAQ section. 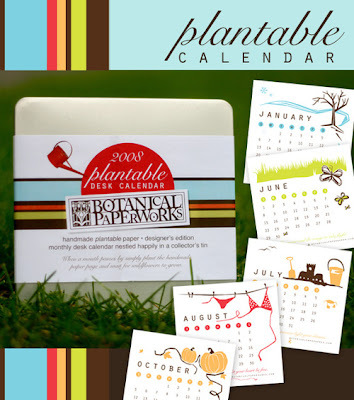 The plantable calender is so clever! I'm going to tell my mom about it so we can have one for our house.